This is a rough computer generated translation, but it gives some idea of the content. Da carefree youth in the hell of dementia of his mother to Yasmin Aga Khan, the shock was brutal. In 1981, the princess discovers that Rita Hayworth, 62, suffers from Alzheimer's disease. That it was called the goddess of love, and marriage to the famous seducer Prince Ali Khan was raised to the rank of princess of the Thousand and One Nights, is lost in an endless twilight. By choosing to accompany him in this trial, Yasmin broke into a universe that she knows nothing: it transforms its combat, its agonies, a universal cause and created the Alzheimer's Association Rita Hayworth Gala. Twenty-five years later, Yasmin Aga Khan is proud of the millions of dollars it could save each year for researchers. In France, the disease affects one million people. She received the title of great national cause. Princess Yasmin Aga Khan.Indeed, it was in 1981, there are already far more than a quarter of a century since, before kissing on a voluntary and absolute this cause, I was faced with the painful loss of my mother, Rita Hayworth , which was diagnosed at age 62, Alzheimer's disease. It had, for months, no unusual behavior that doctors and relatives not understand why. She, once with an incredible memory, actress so bright and talented, can not retain his texts. Mom also lost the sense of direction, confuses things and had, moreover, hallucinations, to see intruders in his house, causing the police to prevent. It really became increasingly strange, and I put it on the back of the drink because she appreciated the spirit and great wines! Remember those terrible pictures that have sadly gone around the world, when in 1981, at the airport in London, she descended, unbridled, the bridge of an aircraft. Realizing that day that it should be really serious, I then headed to New York at Columbia Presbyterian Medical Center where, after simple tests of memory - he called the name of U.S. President, day and date the week, where she lived - and a brain scanner, neurologists have the diagnosis of Alzheimer's disease. I have never heard this word complicated inherited the name of the German doctor who first was in 1906 in Munich, described the disease in a woman autopsia 52 years singular behavior, which he had discovered plaques and degeneration of neurons in the brain. Thus, I decided to stop everything to take care of my mother. Became his legal guardian, I have completely taken over, which meant first for me to stop singing - because I was about to make a career as a singer, after studies in music at the University of Bennington and began to dial. But how could I have the heart to that and get into a profession with too intrusive mother so ill! It was at that moment that I decided to turn this painful disability in positive action. Taking advantage of the fame and glory from that actress adulated and most admired of his time, combining his name with the disease, I then put tirelessly to alert world public opinion on the disease 'AD. First, by joining this year was a modest association founded by a businessman, Jerome Stone, in 1979. We were hardly more than twenty, all very motivated because everyone had a relative suffering from Alzheimer's. One of my greatest strengths at the time was to know President Reagan who once knew Rita Hayworth Hollywood ... As soon as I appeared before him, he invited members of the association and the board in his office Oval the White House, and it faithfully every year until the end of his second term. Thanks to this, I was able, with our team, the alert on the ravages of disease, and explain how lobbying, particularly at the federal level, was essential for us. It helped us enormously in declaring November Month of preventing the disease. Decision officially proclaimed in November 1983 by the Congress, approved and signed by President Ronald Reagan in person. What upsets me now is that it was also a victim of this disease. What is the balance of all those years of perseverance? We now have 75 member states of the Association Alzheimer's Disease International, which I am the president. France was the second country to join us after Australia. Alzheimer's Australia was established in 1985. I am very admiring of their shares and funds paid very important because in many countries, tax deductions are much less important than in the United States. We also obtained that September 21 is World Day of Alzheimer's disease. finance, he supports me every day by marrying my doubts, my joys in this and other areas ... it also gives me ideas. As for my 23-year-old son, Andrew, born of my first marriage to Basil Embiricos - I was married twice - he lives in New York and I see when I go a week per month for meetings of the association. He is very proud of my commitment, who, from very small, has always been affected by my actions ... my responsibilities if I can not be kept behind a desk, I am of course constantly reachable through my BlackBerry . Because the ravages of this disease within me at every moment, even in my remote mountains where I feel that time passes more slowly than in New York, for example ... In fact, to truly benefit from the existence, I rise from 7 am, then I can ski, play golf ... but I am also very happy in New York lights in my apartment on Central Park. Are you proud of everything you've done for twenty-five years? Things do not so, I am pleased that over the years more and more countries have mobilized and are really aware of what this degenerative disease - the first signs may occur from 30 years . For my part, I just think that when you are a princess, who has always had the means to live a very privileged, we must give back to society in one form or another it has made. My everyday life seems empty and sad if I spent my nights in the evenings and my days knitting! Because I feel as driven by a mission, a little voice inside my side to find by all means the cause of this terrible evil to succeed in relieving those who suffer, and their entourage. Mum led a life of fabulous, exciting and painful at times. As an actress and personally, it is almost arrived in the firmament. She had, with my father, Ali Khan - the women considered as one of the most attractive of its time - a marriage of fairy tale ... and even then they divorced, they remained close . Dad was warm, elegant, very loving, a wonderful. Before my father, she was already married to Orson Welles, she had a daughter, Rebecca, my half-sister died in 2004. I had my share of friendly relations with Orson Welles. Mom, who has been very lucky until his illness, was a great lady, having experienced the best and worst. Look at his films you? Of course, with happiness! Channel Turner, a movie channel, recently devoted an entire month to Rita Hayworth. Every Tuesday evening, I saw what emotion, what joy for me, but also for movie buffs that can still be admired, who loved his job and was taking his roles very seriously. I am fortunate that there is still this kind of testimony to keep the mother of my best memory is also important to Andrew that has very little known his grandmother because when he was born, she was already very ill and bedridden. So I brought her grand-son to take the few moments in his arms, but unfortunately Andrew did not remember more! Do you fear being a victim of the disease? I am not obsessed or reassured, and I admit that I sometimes think, because I believe in genetics and thus heredity. My mother was the first victim in our family, who knows what might happen! If the disease can be family, fortunately, it rarely affects each member of a family. Where you have your amazing strength? First of the love of my family, even if, unfortunately, I can see two or three times a year, of the affection of my faithful friends and also I think my temperament positive and voluntary. I am viscerally taken by my action and I want more than anything before he died - I have 59 years - we have found how to stop Alzheimer's disease. Finally, I thank heaven every morning me first given health allows me to enjoy every moment of life because life is short and therefore try not to waste too much time! Honorees, award presenters and guests at the October 27 “So Near & Yet So Far” Alzheimer’s Association Rita Hayworth Gala had a vested reason for the urgency to find a cure for a disease that currently afflicts 5.3 million Americans. When she was 19, Princess Yasmin Aga Khan discovered that her mother, Rita Hayworth, then in her 50s, was suffering from Alzheimer’s. After caring for her mother until her death in 1987 at age 68, she founded the Rita Hayworth Gala. Alexandra Lebenthal, gala chair, wistfully recalled her once “glamorous, vital mommy,” now 79, who no longer recognizes her or her sister. Rita Hayworth Award recipient Muffie Potter Aston told the audience about her grandmother, “a widow at 28 with a young daughter — my mother — in German-occupied Yugoslavia. “She was interrogated by the Nazis… and later honored by the OSS [Office of Strategic Services] as a vital code-breaker for the British. She went from speaking seven languages to barely speaking one.” Attorney Lonnie Wollin, recipient of the Rita Hayworth Lifetime Award, lost his father, three uncles and two aunts to Alzheimer’s. In 1977, Wollin founded the Alzheimer’s Disease Society, which eventually evolved into the National Alzheimer’s Association. Among the guests was a stunning Brooke Shields, whose dementia-afflicted mother once orchestrated young Shields’s rise to fame. The gowns were dazzling, and the statistics mind-boggling: “By 2015, there will be 16 million with Alzheimer’s in the U.S.,” Aga Khan informed. “Somewhere in America, every 70 seconds, doctors diagnose a new case…. Alzheimer’s annually afflicts more [people] than breast cancer and prostate combined. It is the seventh leading cause of death, and affects people in their 30s, 40s and 50s.” And as a kicker for the women in the Waldorf-Astoria ballroom, she added, “Twenty percent of women reaching 65 will develop dementia.” On a large movie screen set up onstage, a film retrospective of Alzheimer’s victims included headshots of George Balanchine, Estelle Getty, Abe Ribicoff, William Powell, Perry Como, Cyrus Vance, Eddie Albert, Vincente Minnelli, Aaron Copeland, Barry Goldwater, Charles Bronson, Otto Preminger, Arlene Francis, Dana Andrews, Floyd Patterson, Burgess Meredith, Ralph Waldo Emerson, Sugar Ray Robinson, Rosa Parks, Charleton Heston, Ronald Reagan and others. “Alzheimer’s took both my grandfather and my father,” said David Hyde Pierce, who whimsically informed, “Yes, I used to be Niles” — a reference to the character he portrayed in the long-running TV sitcom “Frasier,” currently in reruns. “There are two dozen drugs in clinical tests at this time,” Pierce said. A star of such recent Broadway hits as “Spamalot,” and “Curtains,” Pierce, who also had a supporting role in the 1988 film “Crossing Delancey” (back then, he was known as David Pierce), admitted that being “unemployed” was the reason he was able to attend the gala. Underwritten by Rolex Watch USA, the event raised $5 million. Roger Waters, founding member, lyricist and principal composer of Pink Floyd, performed “Wish You Were Here.” The Pointer Sisters topped off the evening’s entertainment. featured are noted doctors from Boston University and Yasmin Aga Khan, president of Alzheimer’s Disease International and daughter of Rita Hayworth, who had Alzheimer’s, and former Westborough resident Skip Curtis. The Rotary Club of Westborough and Westborough Council on Aging cordially invite you to a screening of the documentary film "I Remember Better When I Paint." This film by Eric Ellena and Berna Huebner, presented by French Connection Films and the Hilgos Foundation, and narrated by Olivia de Havilland is the first international documentary about the positive impact of art and other creative therapies on people with Alzheimer's and how these approaches can change the way we look at the disease. Among those who are featured are noted doctors from Boston University and Yasmin Aga Khan, president of Alzheimer’s Disease International and daughter of Rita Hayworth, who had Alzheimer’s, and former Westborough resident Skip Curtis. Where: Westborough High School Auditorium, 90 West Main Street, Westborough, MA 01581. Parking will be available in the school lots. Tickets are available at the Westborough Senior Center, 4 Rogers Road and at Central One Credit Union, South Street, Westborough, MA 01581. Call Westborough Council on Aging at 508-366-3000 for further information or Carol Burtt Borglund, Rotary Club of Westborough, 508-922-6358. This event is co-sponsored by the Community Service Committee of the Rotary Club of Westborough and Westborough Council on Aging. Proceeds will be split between local charities and the Skip Curtis Fund at Boston University Alzheimer’s Disease Center, Boston University, MA. > This February 6, 2011 marks the centennial of Ronald Reagan’s birth. > going to rehash the debate here. > Library, I swerved into these actions unexpectedly. > such as tying a shoelace or making a bed, become bewildering. > eerie harbinger of what was to come. > decline due to, of all things, Alzheimer’s disease. > letters exchanged between Reagan and Yasmin Aga Khan. > alcohol, which made her “very difficult” as a mother. > concern, public and private, for this disease and its victims. > Little did he know it would one day claim him, too. > was much more to that story. > America’s Adversaries Have Manipulated Progressives for a Century." 28th Annual Rita Hayworth Gala. Hosted by Alzheimer's Association, benefiting research on Alzheimer's disease, and care and support for victims and families. Yasmin Aga Khan, la fille de Rita Hayworth et d’Ali Khan, est une femme de conviction. Sa vie n'est ni mondaine ni frivole, elle est dédiée à la lutte contre la maladie d’Alzheimer. Comment oublier ces terribles photos&#8201;? A l’aéroport de Londres, l’emblématique Rita Hayworth descend, échevelée, la passerelle d’un avion... A tort, on attribue son comportement à l’alcool... Cette image bouleversante a toujours hanté Yasmin Aga Khan, sa fille. C’est elle qui l’a décidée à se battre pour rendre à Rita Hayworth son honneur perdu. Un jour du printemps&#8239;1983, quatre&#8239;ans avant la mort de la star à New York, Yasmin monte à la tribune du Congrès américain. Pour témoigner. Sa mère, l’actrice la plus adulée de son temps, est une des innombrables victimes de la maladie d’Alzheimer. Les sévères membres du Congrès sont impressionnés par la beauté de la princesse, son élégance, son panache, mais aussi par sa détermination. Sur sa lancée, elle se rend dans le bureau Ovale pour demander son appui au président Reagan, qui a connu la star à Hollywood quand elle était mariée avec Orson Welles. Ce soutien sera sans faille. Pour Yasmin Aga Khan, être une «&#8201;fille de&#8201;» ne fut pas si simple. Héritière du séducteur Ali Khan, flamboyant prince d’ascendance persane avec autant de moyens que de charme, et d’une icône du cinéma, la demi-sœur de Karim Aga Khan, 49e&#8239;chef spirituel des ismaéliens, n’a jamais été une enfant gâtée. La jeunesse de Yasmin, orpheline de père à l’âge de 10 ans, fut mi-heureuse, mi-douloureuse. Vingt ans plus tard, la voici confrontée à la détresse de sa mère. Elle va alors pouvoir utiliser son nom prestigieux, et sa notoriété. Au lieu de papillonner avec grâce dans les salons mondains, la princesse rejoint comme bénévole l’association d’Alzheimer, qui compte à l’époque à peine plus d’une vingtaine de membres. Depuis, sous son impulsion, elle s’est développée en 83 branches internationales. Quant au «&#8201;Rita Hayworth Gala&#8201;», le dîner de charité qu’elle organise deux fois par an aux Etats-Unis, il a remporté au total 66&#8239;millions de dollars&#8201;! &#8201;: «&#8201;Quand on appartient à un milieu très privilégié, on doit rendre à la société, sous une forme ou une autre, ce qu’elle vous a apporté et soulager ceux qui sont dans la détresse.&#8201;» Tel est le secret d’une grande dame qui, plutôt que de mener l’existence frivole d’une princesse des Mille et Une Nuits, a choisi de se faire un prénom. Yasmin Aga Khan , daughter of Rita Hayworth and Ali Khan, is a woman of conviction. Her life is neither worldly nor frivolous, it is dedicated to the fight against Alzheimer's disease . 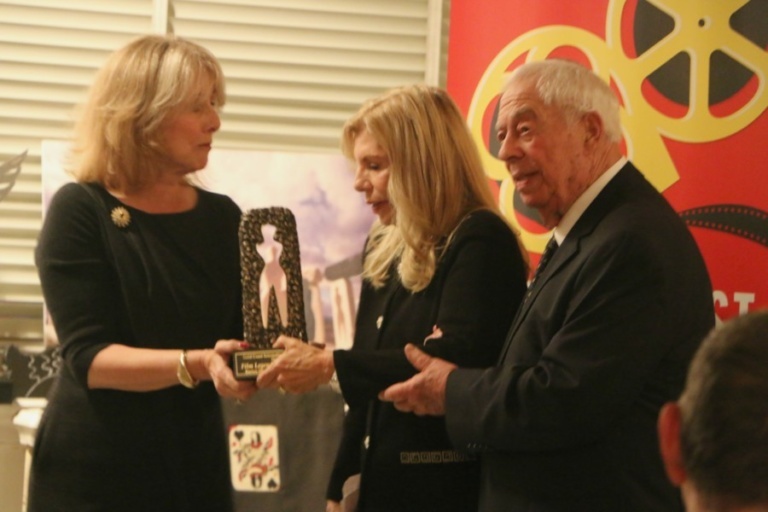 The Gold Coast Arts Center and International Film Festival last night paid tribute to Rita Hayworth honoring her with the first Hollywood Golden Era Award. Princess Yasmin Aga Khan, Rita Hayworth’s daughter accepted the award that was designed by internationally renowned artist/sculptor Edwina Sandys, granddaughter of Winston Churchill. The event was held in the gorgeous Soho loft of Ms. Sandy’s. The event included Haley Swindal who paid tribute with a Hollywood tribute and a few of the songs Rita Hayworth made famous. Budd Burton Moss, Rita Hayworth’s agent and longtime friend paid tribute to her, as Joel Grey, Budd’s longtime friend introduced him. 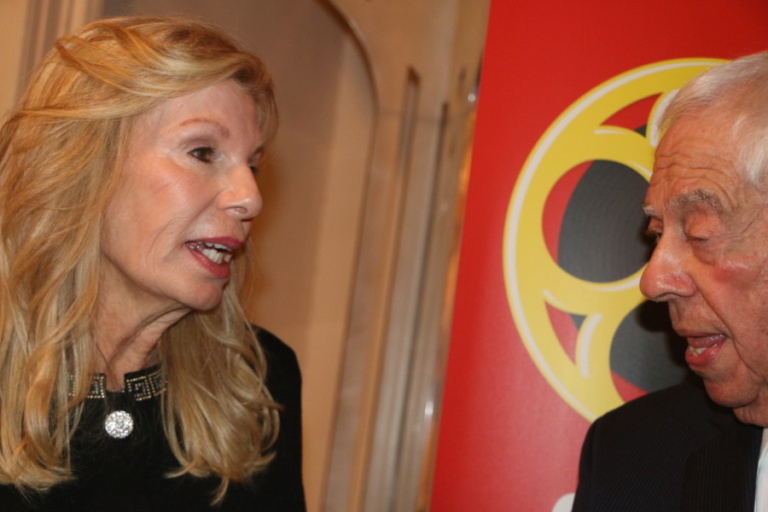 Regina Gil founder and executive director of the Gold Coast Arts Center & International Film Festival presented the award to Princess Yasmin Aga Khan. Caroline Sorokoff, director of the Gold Coast International Film Festival and associate director talked about the amazing things the art center does. One of their programs Making Memories is a series of special programs specifically designed for people living with memory loss and their caregivers. Individuals of all ages enjoy clips of classic films, followed by guided conversation and reminiscence. Recognizing that movies have the power to spark memories and create emotional connections, these events present an opportunity to engage in discussion while socializing with others, which most Alzheimer’s and Dementia patients need. The Festival’s tribute to Rita Hayworth will be held November 11th. The Festival will also celebrate the 60th anniversary of Pal Joey, starring Rita Hayworth, Frank Sinatra and Kim Novak with a screening of the film followed by a live Q&A with Sinatra’s granddaughter, Amanda Erlinger. Since its inception, the Rita Hayworth Gala has raised $75 million to combat Alzheimer’s. This year, Khan will be chairing with Anne Hearst McInerney, and the theme will be Denim and Diamonds. Rolex will once again be the sponsor. On Tuesday, October 23, 2018, the Alzheimer’s Assocation hosted it’s 35th annual Rita Hayworth Gala at Cipriani 42nd Street. The event raised $1.6 million for critical Alzheimer’s care, support and research programs. Willie Geist, host of NBC News’ Sunday TODAY with Willie Geist and co-host of MSNBC’s Morning Joe, emceed the event and toated Rita Hayworth’s 100th birthday, which would have taken place on October 17. The evening also included remarks from Gala General Chair and Founder Princess Yasmin Aga Khan and 2018 Gala Co-Chair Anne Hearst McInerney, along with David Hyde Pierce and Oliver Johnson Kennan, and special live performances from rising country music star Jay Allen and singer-songwriter Patty Smyth McEnroe. To the world, Rita Hayworth was a fiery-haired love goddess who captivated audiences on the big screen with a single slip of a satin glove, served as one of America’s favorite pinups during World War II and kept Fred Astaire on his toes — but to Princess Yasmin Aga Khan, she was just mom. The actress, who would have turned 100 on October 17, passed away in 1987 in her New York City apartment at age 68 from Alzheimer’s disease. Her youngest daughter has since founded the annual Rita Hayworth Gala through the Alzheimer’s Association to keep her mother’s legacy alive, all while raising funds to support studying the disease in hopes of finding a cure. The 2017 event raised $2 million and a grand total of over $75 million. The 35th annual gala takes place on October 23 in New York City. But to Khan, 68, presiding over the gala continues to be bittersweet. The Alzheimer's Association held its 35th Annual Rita Hayworth Gala Tuesday night at Cipriani 42nd Street. The theme of the event, Blazing Trails, was a celebration of breakthroughs that are being made in eradicating Alzheimer's, and a nod to Hayworth's role in the movie They Came to Cordura. The evening raised $1.6 million for critical Alzheimer’s care, support and research programs. More than 5.7 million Americans are living with Alzheimer’s disease, and it is the sixth leading cause of death in the United States. Princess Yasmin Aga Khan founded the Gala in memory of her mother, Rita Hayworth, who was diagnosed with Alzheimer's at a very early age. As her mother's primary caretaker, Khan experienced the devastation of the disease up close. When Khan's dear friend Libet Johnson was diagnosed with Alzheimer's, also at an early age, Khan's heart sank for the struggle Johnson would have to endure. Known for their philanthropic endeavors, the Johnson family have been deeply involved with the Alzheimer's Association, and Khan presented them with the Champion Award in Libet's memory. The most powerful moment of the evening was country superstar Jay Allen's performance of his hit song, Blank Stares, written about his mother who is living with Alzheimer's. Allen and his band mate slowly brought his mother on stage, and as she put her arms around him in a loving embrace, he performed this heartbreaking song, knowing full well she had no idea who he was. There wasn't a dry eye in the house. “I hardly can think of a family I know that has not been touched by Alzheimer’s," said Geist. "There are nearly 6 million Americans suffering with the disease, and that means there are many millions more caring for them, and suffering themselves with the utterly devastating heartbreak of watching someone they love drift away. The Alzheimer’s Association is aggressively fighting to put a stop to it, and I’ll always do whatever small part I can to help that effort." Anne Hearst McInerney, who Co-Chaired the evening with Khan, made sure to bring a little levity to what could have been a somber evening. The dress code was Black Tie Denim and Diamonds, and McInerney's table didn't disappoint. Cowboy hats and Navajo jewelry abounded. Sandra and Eric Ripert made sure to wear bandanas around their necks, Donna Dixon and John McEnroe wore cowboy hats. Stellene Vollandes, Jay McInerney, Nicole Miller and Candace Bushnell enjoyed corn bread with their Italian-style short ribs (this was Cipriani, after all). Hearst McInerney got the California Cowboys, her favorite Western band, to play. After a few songs, Scandal's Patty Smyth McEnroe performed a short set with them, an upbeat way to close out the evening. Princess Yasmin Aga Khan poses for a photograph at the Aga Khan Museum in Toronto, Ont. on March 29, 2019. In addition to caring for her mother, Princess Yasmin, who is a step-sister of the Ismaili Muslim spiritual leader, the Aga Khan, also became an early spokesperson for those with Alzheimer’s, bringing public attention to a neurodegenerative disease that few openly discussed. On Friday, she was in Toronto to participate in a film screening and panel discussion at the Aga Khan Museum on the benefits of the arts for individuals living with dementia. Princess Yasmin, who is president of Alzheimer’s Disease International, a federation of Alzheimer’s associations worldwide, spoke with The Globe and Mail about how the disease affected her family. What was it like when your mother began showing signs of Alzheimer’s? She started with symptoms in her early 50s. There was a lot of confusion, disorientation, mood changes, and she became quite aggressive. She’d hear voices outside the house and call the police. The police would come and there was nobody there. She had also been drinking – not heavily, but the alcohol exacerbated the plaques and tangles in the brain that were being created with the disease. I thought she had this serious drinking problem, but there was this element of brain disease. She was forgetful, accusatory. It was confusing and difficult, and it wasn’t until she actually had a collapse that I could get her to a doctor. What was it like to diagnose Alzheimer’s then? She had a brain scan and she had memory testing by a neurologist. And between the brain scan and the memory testing – like “who’s the president of the United States?" – they actually diagnosed her then, which is quite unbelievable. It was confirmed on autopsy when she passed, where you could see the plaques and tangles. But what we could see in the scan back then in ’81 was shrinkage of the brain. Alzheimer’s wasn’t widely talked about at the time. What prompted you to open up about it? The Alzheimer’s Association in the United States, founded by Jerome Stone, they found me because they had heard rumours that my mom was diagnosed. I was the caregiver, but they were my caregivers. They were there to support me and to help guide me on what to do and what to expect. It was a very small organization at the time; now it’s a national and international organization. Then, the press came to me. I talked about it and kept talking about it. A lot of people are still reluctant to talk about dementia. That’s our biggest problem, and I’m not sure why. There are famous people not coming forward, not talking about it. Maybe it has to do with their careers. Embarrassment? I don’t know. How did art help your mother? She actually painted. I think she started painting in the early stages of her disease. She loved it. It brought her peace and she had some talent. She also used to love to play the castanets. There weren’t medications at the time. Today we do have medications, which can help slow it down for some people, and also help the mood. I think that’s where painting comes in and music comes in, with mood, to help relieve the stress. Did you find an outlet too? I coped because I had the Alzheimer’s Association. I was very fortunate, which many people aren’t, to have 24/7 nursing care. They really helped me and saved me. My friends and family were also there for emotional support. But it was a difficult road. When I went to university, I was a music major. Timpani was my specialty, and voice. I was going to go to Europe to study, and that’s when my mother’s disease heightened, and it was really necessary that I step in. Then I said, okay, this is more important than my career in music. And that was the right decision. I don’t have any regrets. What message do you want to share with others? That there’s hope. There’s education on the disease. That one can change the mood by introducing art. It’s not a cure. It’s a momentary time of pleasure.